Denervation Recovery Day Four – Living life the MegaSpecial way! I’ve had Deb at home as it’s Monday, her day off. The Only class I didn’t attend was the MS exercise class. Like I said in yesterday’s blog, even though it’s all seated exercise it would still be too much for me to do! Because Deb was home that was a good distraction for me to not keep checking the time, although I did have a few cheeky time checks. No comments on facebook about it either, I can’t help but think I wasn’t missed. Silly of me right! I just don’t like to miss out on anything! Right or wrong, that’s who I am! We had some visitors this afternoon, another good distraction from the pain! My Dad and Stepmum popped round with their 2 sight hounds, Ava the Saluki & Finly the Lurcher. They have only had Finly for 6 weeks so him and ours are still getting to know each other. All fun and games! A great distraction from the pain I’m still getting in my legs and spine when I’m standing. A boring hour and half whilst Deb and Adam went off to Fight Klub! 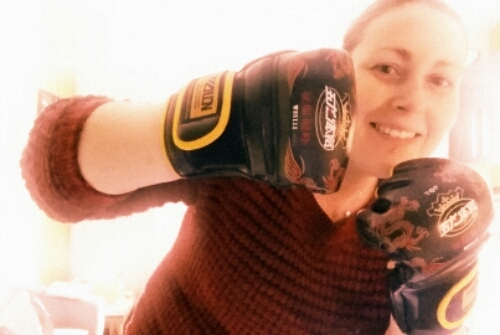 I’m not a happy bunny, I’ve got my new boxing gloves and can’t try them out! Humph! I have to be prepared for my mood tomorrow! I’ll be missing Pilates with Hannah Bailey and then Body Combat in the evening with Gill Cathcart! What on earth did I used to do before exercise took over my/our life! I know I wasn’t as happy when I didn’t go to the gym or all these classes! If we all just did a little bit more to look after ourselves would we be living in a happier world?